Preheat the oven to 220°C/430°F. Cut potatoes into thick slices and then slice into fries. In a bowl, toss them with the salt, garlic powder, smoked paprika, and olive oil. Add the starch and toss well to coat. 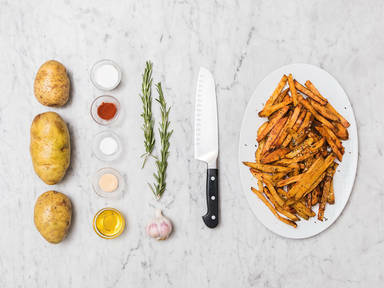 Transfer fries to a parchment-lined baking sheet and bake at 220°C/430°F for approx. 40min. In the meantime, finely chop the rosemary and mince garlic. Add to a bowl with a little salt and mix together. When the fries are crispy, sprinkle them with the garlic and rosemary mixture and serve immediately.